What is the humanities if not the stories of people? The Humanities Matter Bus Tour and Webseries will serve to engage the public with this notion of humanities education. This summer, the teams behind the DHMakerBus and 4Humanities collective, together with Alex Gil from Columbia University, are planning an extraordinary experience. In order to counter the negative press that the humanities have been getting, and to show the world just how passionate we are about our beliefs, we plan to travel across the USA and Canada to advocate for humanities education. Along the way we’ll be interviewing humanists from all walks of life and documenting the places they work, the things they do, and what makes the humanities matter. Our arrival at DHSI 2014 will mark the end of the tour, and the first of three webisodes on Humanities Education will be debuted in Victoria. 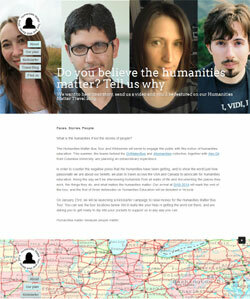 On January 23rd, we will be launching a Kickstarter campaign to raise money for the Humanities Matter Bus Tour. You can see the tour locations below. We’d really like your help in getting the word out there, and are asking you to get ready to dip into your pockets to support us in any way you can. Humanities matter because people matter.